There are many benefits to teaching any dog to wear a muzzle. This includes benefits to both the outside world and the animal in question wearing the muzzle. And, of course, you as the owner. First and foremost, a muzzle creates a physical barrier between the energetic (sometimes dangerous) hub of the dog—the dog's mouth—and the rest of society. When dogs struggle with aggression, both the animal and those around them find themselves in danger. A dog bite or attack can be fatal to human life while also result in the quarantine or euthanasia of the animal. Neither one is worth the risk and muzzles can help eliminate the probability of these occurrences. At the first mention of the word muzzle, most people picture harsh, restrictive, painful looking contraptions and associate them with cruelty & control. The reality is quite the opposite. Thankfully, due to the increasing need and popularity of muzzles, the industry has adapted to deconstruct the stereotypes attached to these seemingly cruel devices. Today’s muzzles are anything but hard and uncomfortable. The market is filled with thoughtfully-engineered muzzle designs made from a range of materials for different intensity levels. The last thing anyone wants is to have to deal with legal action on account of their pet’s behavior. 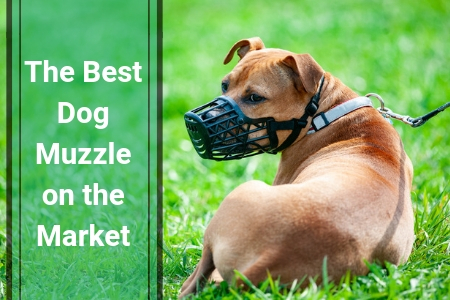 Investing in a muzzle of some sort may be the best thing for your dog. Why Would You Need a Dog Muzzle? The goal in muzzle usage is no longer control, but rather to be used as a tool in aid of training and behavior molding. As its owner, you are solely responsible for getting the dog’s behavior under control as quickly as possible. You would likely turn to training specialists in order to do so. In the interim, a muzzle would provide a valuable insurance policy while your dog slowly learns and grows. It’s also necessary to take high-stress situations into consideration. Like humans, dogs feel anxiety and panic. These emotions can be brought out by instances involving invasive, uncomfortable experiences, such as visiting the vet. How a dog negotiates high levels of stress is up to the dog itself. Some may become sullen and withdrawn while others might act out in aggression toward the caregiver. In any event, it would be safest to fit a muzzle to the dog prior to these excursions. Perhaps the least frequent—but still important—of events requiring the presence of a muzzle would be coming across a stray dog in need of assistance. Lost or stray dogs who appear injured will require your swift assistance. Since the animals are unfamiliar to you so too is their temperament. It’s advisable to fit a muzzle to the stray before attempting to rescue or provide assistance. This leads to ensuring your safety in the unfolding of events as well as the safety of anyone else you bring the animal in contact with. These animals can have intense levels of fear and this usually develops into them using aggression as a coping mechanism. Yes, some strays will simply be timid, but they’re unpredictable so you never know when one will lash out at you. A muzzle is how you can prevent an unfortunate situation. What it really comes down to is that it’s usually better to apply a muzzle than not—no matter the situation. The benefits outweigh the risks, even in seemingly harmless situations like a stroll on the beach or when a child comes over to visit your home.Now you simply need to pick the right one for your situation. Muzzles can be broken up into two main categories: slip muzzles and basket muzzles. Slip muzzles are intended for quick use over short, sporadic periods of time. As the name suggests, these muzzles slip over the nose and mouth of the dog. Picture a cylindrical tunnel-shaped device holding your dog’s jaws together. 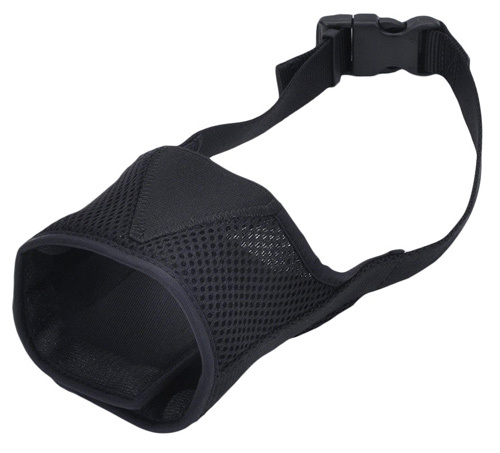 Slip muzzles are made from fabric or mesh and are usually adjustable. Slip muzzles are usually easier to fit compared to basket muzzles. They are also generally more comfortable for the dog; however, they can restrict the ability to pant if fitted too tightly. Basket muzzles, on the other hand, allow much more panting freedom, in spite of being more encompassing. This device will cover the entire mouth of the dog and allow almost no use of teeth or tongue. Since they are less restrictive of the jaw compared to slip muzzles, basket muzzles are the more humane choice to use over long periods of time. These muzzles range in materials and intensity. They take a bit longer to put on but are less stressful for your dog to wear. Let’s take a look at the different makes of muzzles that branch from these two main categories. Soft muzzles are intended for dogs with naturally weaker bites. They’re lightweight and made from softer materials that make them more comfortable than other muzzles. The issue with soft muzzles is that should you mildly underestimate the ability of your dog’s jaw they may be able to break open the soft muzzle and bite anyway. Soft muzzles are typically made from a single, solid piece of material and, therefore, do not allow much natural ventilation. The earliest style of dog muzzles is those made of leather. They’re the longest lasting and most durable design of muzzle on the market. Leather slip muzzles are intensely restrictive and allow no panting or ability to consume water. Leather basket muzzles, though tough, are less restrictive and will still allow your dog to receive treats or have a drink. Grooming muzzles are intended for one use and one use only… grooming. They’re not ideal for dog training at all. Grooming muzzles are usually made with a single sheet of nylon. There will be a small hole for breathing on the tip. They don’t allow a dog to drink, pant, or receive treats. For this reason, they’re only ideal to use for short periods of time. In the event of an emergency, you won’t have a selection of muzzles to pick from. In these instances, it’s possible to craft an emergency muzzle from scraps and everyday items lying around. Strips of material or gauze work best though ribbon has been reported to get the job done as well. Using these materials to wrap and secure the jaw of a dog can provide valuable protection from bites or aggression during the emergency situation at hand. These are essentially just basket looking contraptions made entirely from metal or wire. Though they tend to look the most inhumane of all the muzzles, they are usually the most comfortable provided they are properly adjusted to fit. Metal muzzles come with many movable parts in order to provide the exact right fit for each individual dog face. Metal muzzles prevent barking completely. These are known as the best overall type of dog muzzles. They’re ideal for any situation. Whether you are in the process of training an animal or need protection from a dog’s bite, this can be your default choice. Though incredibly secure and durable, plastic muzzles don’t restrict panting or ability to consume water. When used during training you will still be able to feed your dog treats and let him or her know the muzzle isn’t in complete control. Plastic muzzles are always made in a basket shape. Now you have more information, pick the ideal one for your dog. This is a soft muzzle by Coastal in a slip-on design. This muzzle would slide over the mouth and nose of the dog & come to rest just before the eyes. Coastal has cleverly fitted this design with an elasticated panel that prevents the mouthpiece from riding up to irritate the eyes of the dog. The muzzle is secured by an adjustable head strap fitted with a loop and hook. It’s made from black mesh and, although restrictive, not enough to prevent panting or water consumption. For this reason, the muzzle could potentially be used for longer periods of time compared to the common slip muzzle. The muzzle is best suited to dogs with a nose circumference of four inches give or take. A dog with a significantly smaller snout may still be able to bark while wearing this device. Overall, this is an interesting rendition of the typical slip muzzle. It’s far more humane and gentler than others of its kind usually are. This Coastal muzzle is a more traditional take on the slip muzzle. It’s as basic and as straightforward as they come. If control and bite prevention are your main goals, then this is the muzzle for you. You would not find this practicalin training situations as it allows no mouth use at all. Your dog will not be able to pant, drink, or receive treats. It’s also recommended that you use this muzzle only for periods of 15 minutes or less. The muzzle is essentially made up of two main straps: one that wraps the mouth and one that wraps the neck. They’re connected and so they keep the entire jaw from opening or closing. In spite of the full restriction, the comfort muzzle is made of soft mesh and will not irritate the flesh of the animal. 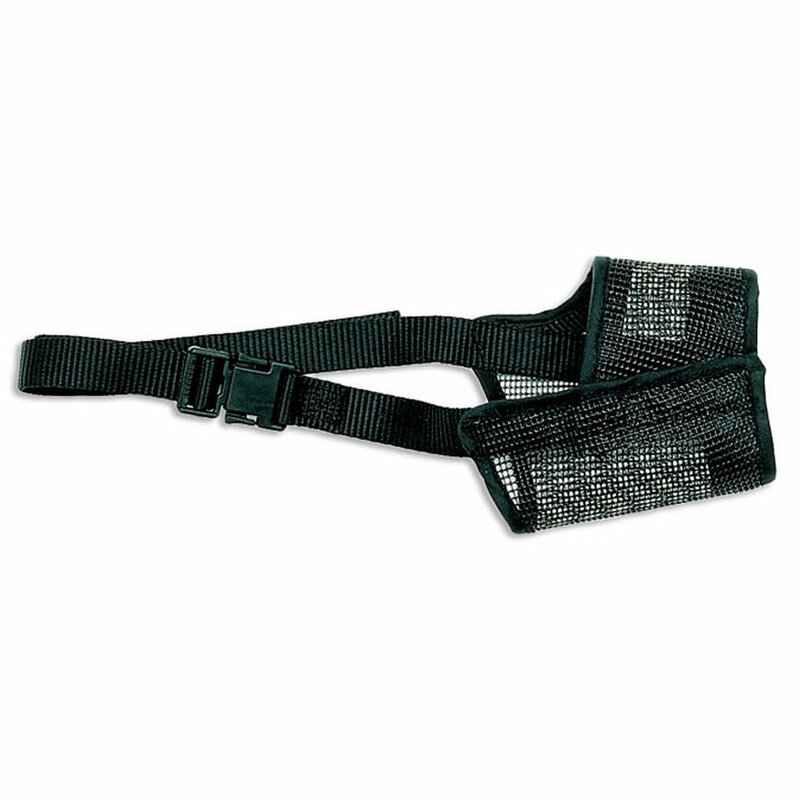 It’s also fully adjustable on both straps making it suitable for dogs of any shape and size. Our final selection from the Coastal muzzle range. The adjustable black muzzle may appear like a basked style unit but it’s actually just an extended slip. The actual nose loop is significantly longer than other slips and it covers a wider surface area of the dog’s face. This provides added protection and security in dogs with stronger jaws. The mesh is soft and breathable, it will not overwhelm the animal that wears it. It’s thin enough to act as a sort of second skin. The great thing about this range from Coastal is that this muzzle comes in sizes ranging from extra small to extra large. Your dog will have the perfect fit without having to rely on adjustability. As a Coastal standard, this muzzle also features an elasticated strip that prevents eye irritation. If you intend to use a dog muzzle for training purposes you will need to ease your pet into the idea of the muzzle first. The process should be well intended and non-threatening. If your dog develops fear or mistrust of the muzzle before it has even touched his or her face then you will struggle to use it for the intended purpose. Hold the muzzle in close proximity to your dog. Gesture to the muzzle and reward your dog with a small treat every time he or she looks at the object. To gain further trust in the muzzle, tape a small piece of food on the inside and encourage your dog to investigate. Allowing them to sniff and examine the muzzle & food creates an illusion of pleasure around the object. Eventually, allow your dog to eat the food that you attached to the muzzle. Let them enjoy it as you hold the muzzle yourself, never breaking the link between you, the dog, and the device. This is important, as the muzzle needs to be seen as a connection between the two of you—not a tool for control. Once you’re certain that enough food has been consumed and there’s a level of enjoy ability around the muzzle, you can fasten it for the first time. Do it while your dog is busy eating the attached treat. Gently clip and fasten the securing straps around your dog and leave it on for a few minutes. By this point, your dog will likely be comfortable but confused. This object that was once separate is suddenly attached to him. If done correctly, hew on’t fear the object itself but understand this experience is new & uncertain. Remove the muzzle and repeat with more food & longer intervals of time. Throughout muzzle usage, it’s vital to embrace the notion of “treats” as often as possible. This applies regardless of the context in which the muzzle is being used. Whether an animal is in distress, aggression, or training they can benefit from the momentary relief of a treat. This action gives them a break from the overall perceived restriction that comes with wearing a muzzle. It reminds them that there are still positive things available to them and that good behavior is rewarded. 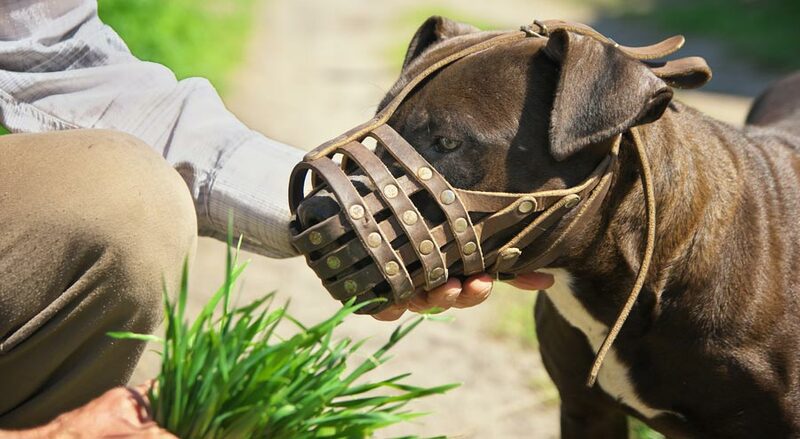 Treating a dog while wearing a muzzle can even lead them to look forward to the experience. They’ll no longer flinch or hide when you bring out the muzzle before their evening walks. There will be no manic hysteria in the back of the car en route to the vet. The promise of a snack looms in the distance and the muzzle is symbolic of this welcome event. When in the market for a muzzle for your dog, there are multiple factors to take into consideration. Being clear on the style, intensity, and purpose for use can make muzzle usage far less stressful. First and foremost, safety should be your absolute goal; safety of yourself, strangers & your dog. Always keep in mind that each dog is an individual and their muzzle should be chosen & fitted to suit them and the circumstance you use it in. And now you know how to break the negative stigmas attached to muzzle usage. Enjoy a simple device that, when used correctly, will help you better connect with your dog. 1 Why Would You Need a Dog Muzzle?